That is the title afforded to every member of the staff in a gentleman’s kitchen. I recently had the honor and pleasure of being in the kitchen with four extraordinary gentlemen by the names of Bocuse, Boswell, Boulud, and Keller. Watching them orchestrate the “dinner of the decade” at Stella! was not only a rare treat, but more significantly, a lesson in civility and dignity. 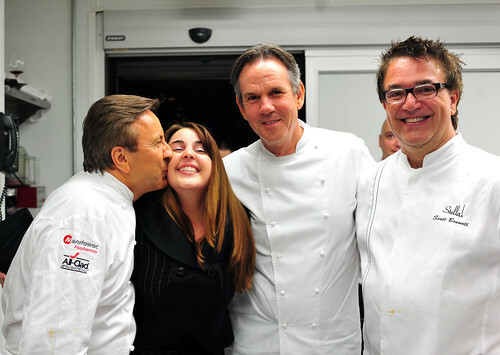 “Oui, chef” is how Daniel Boulud and Thomas Keller respond to each other when they are in the kitchen together. “Oui, chef” is also how they respond to their sous chefs and cooks. In their kitchen, there is a chain of command. But above all else, there is mutual respect. I had gotten in late the night before (well, it was actually the wee morning) and was up early for a beignet breakfast at Cafe du Monde with a couple of the sous chefs, followed by a visit to a farmers’ market. Thereafter, I spent the rest of the day at Stella! watching them and the rest of the staff prep for the B.I.R.D.S. 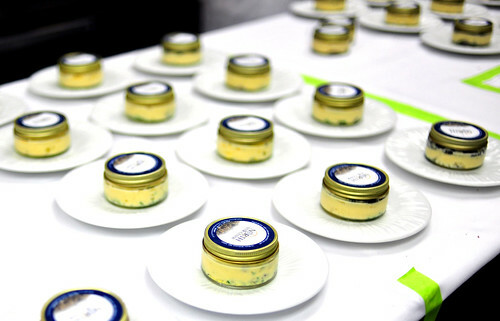 and Bocuse d’Or fund-raising dinner that night. The evening started with a cocktail reception in the garden of the Ursuline Convent, a block away from Stella! Despite the warm, humid mid-day, it had mellowed into a pleasantly balmy evening with a slight breeze. The blue skies couldn’t have been more blue. Media were afoot – cameras, field reporters, journalists. And designer gowns and tailored suits – who each paid $2,000 each to attend – air-kissed one another with cocktails in hand. After a round of introductions and a few speeches, two checks for $50,00 each were presented, one for B.I.R.D.S. and one for Bocuse d’Or USA. And cut to B-roll of guests resuming their mill-about. 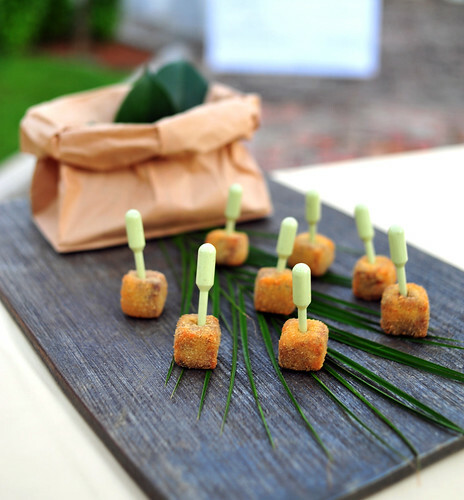 Servers circulated hors d’oeuvres. They included Thomas Keller’s famous salmon cornets, set in a specially designed tray, and beautifully burnished squares of brioche sandwiched with a fine, frog leg boudin blanc studded with black truffles. 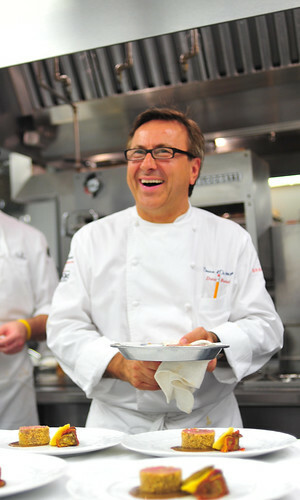 Two of the more curious creations came from Daniel Boulud and his sous chef Greg Stawowy. There were cubes of raw hamachi enveloped in clouds of meringue stained garnet with beet juice. And there were warm and comforting cromesquis de tête de veau impaled with mini basters that cleverly doubled as handles and a delivery mechanism for sauce gribiche. Scott Boswell served true Kobe beef, which I got to taste at a dinner the night before, in Korean-style “spring rolls” spiced with kimchee. Riesling “pearls” and Marcona almond nuage. Carrot, cumin, coriander, and lime. 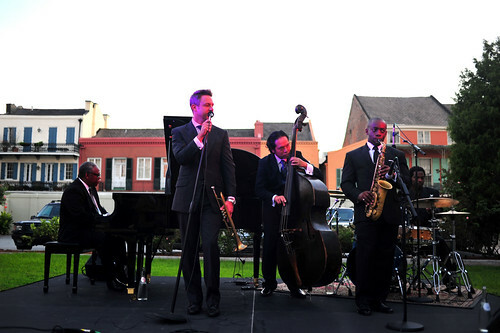 Elbows well-rubbed, guests adequately liquored, and with dinner ready to be served, a brass quartet at the convent’s gates struck up “When The Saints Go Marching In.” As guests followed the musicians out of the convent, they were given a white napkin to wave in a second line march to the restaurant. Seven sea salts, soy and miso powders, wasabi honeydew, and sweet soy sauce. Candied Louisiana pecans, aged balsamic vinegar, and petite basil and mint ice cream. Scrambled egg mousse and accoutrements. Charles de Cazanove, Champagne Brute Rosé, France N.V.
Slivered snow peas, leeks, and black truffles. Tasmanian black truffles and tasting of cauliflower. Caramelized fennel bulb, confit bayaldi, sweet garlic tortellini and Niçoise olive jus. Robiolo Bosina, cherry compote, “golden honey gelée,” toasted walnut oil, and petite greens. Coconut sorbet, caramel and frozen chocolate mousse. A sold out event, the headcount hovered around seventy. Tanya Boswell, my gracious hostess, put me at a table with three extraordinary individuals, whose company I could not match with my own. To protect the innocent, I’ll simply refer to them as Harpo, Tabasco, and McManus. A last-minute round of musical chairs switched out McManus for a wonderful southern gentleman I’ll call Vermillion. Of them, I beg forgiveness for my between-course absences, when I disappeared into the kitchen to watch the next courses get plated. Pacing was perfect. 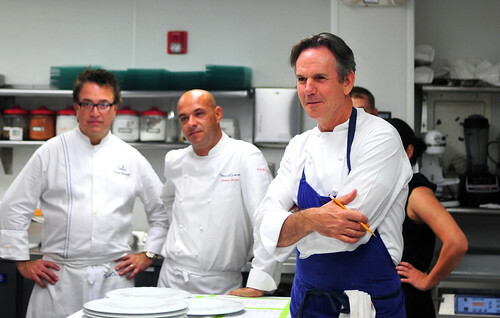 If you’ve ever had the pleasure of watching Thomas Keller expedite, you’ll know why he is so revered and respected. Under his control, the kitchen seemed to operate on autopilot; calm, steady, and smooth. Everything happened like clockwork. Service was truly excellent. The staff didn’t miss a beat. Tap (Fiji) or sparkling (Badoit), your choice was poured, regardless of what your tablemates were drinking. An arsenal of silverware was coordinated and deployed for each course, not a tine out of place, or chopstick missing. Wine glasses too, were filled at each turn by the sommelier, John Mitchell, who presented and poured the wine pairings. And, with all of my up-and-down during the dinner, the servers must have gone through a hamper worth of linens just for me, replacing my napkin anew for each round-trip flight (I am not proud of my carbon footprint for that night). All of the dishes were very good. But I’ll linger a while on three in particular. Bocuse’s “Lobster à l’Américaine” probably shaved a good five years off my life. I’ll die early, but immensely happy. The sauce a l’Americaine, which was poured around the lobster at table, was incredibly rich, thickened with cream (and probably butter), and intense with lobster stock. It was the last word on bisque. The lobster tail, which was set over a bed of silky, blanched leeks, was tender and moist, pre-cut into sections for the convenience of the diner. Strips of black truffles garnished the bowl. A page from the Old World, this was excellent. Keller’s “Elysian Fields Farm Lamb en Persillade” was spectacular, in part because of the wine pairing, to which I award best in show. De-boned, the rib chop had been rolled, cooked sous vide, and then coated with a layer of breadcrumbs mixed with parsley and garlic (i.e. en persillade). The lamb was extremely tender and faintly musky, which I love. The accompanying “biyaldi” (i.e. a tomato paste-driven ratatouille), together with the Niçoise olive sauce, was an extraordinarily intense wallop of Provençale flavors. After the last dessert was finished, an army of chocolates and petits fours were marched out to the tables, along with gift bags stuffed with goodies, including a signed menu. The chefs came through the dining room to receive their applause and to thank everyone. I note that Thomas Keller walked through the room and shook every single person’s hand, patiently stopping for photo ops along the way. The dining room cleared, the chefs retreated to the kitchen to sign menus for the staff and to pose for photos. Thank you Scott and Tanya Boswell, for being such gracious hosts. Thank you, John Mitchell, Lorie Oustelet, Daniel Dilberger, Luis Ochoa, and the staff of Stella! for giving me a license to roam (that’s code for “getting in the way of servers and taking up precious kitchen space”). It was a magical evening. I also note that Farmer Lee Jones (whom I dub the vegetable Santa) of Chef’s Garden, with whom I had the pleasure of dining the night before, and with whom I had the pleasure of standing in the kitchen during this night, donated much of the vegetables for the dinner. Farmer Jones, you too are a gentleman. ~ by ulterior epicure on September 29, 2010. Nicely done! I wish I could have been there! @docsconz: Thanks. I wish you could have been there too! I thought about dedicating the sum total of my summer job’s earnings to flying home for this dinner, but even then I couldn’t make it work. I am embarrassed to think of the things that I actually would have done for a seat at this dinner. Would you agree that it was the dinner of the decade? Seems like it must’ve come close at the very least. Thank you for your stunning prose, gorgeous pictures, and witty anecdotes – they’ve made for a top-notch vicarious experience, which is the most I could’ve hoped for. The black truffle is a great condiment to any salads & pasta dishes. Black truffle farms are big business in Spain & other parts of the worlds. Dont let any one try to tell you that the black truffle cant be farmed.